Disclosure: I was provided with these craft kits from Oriental Trading free of charge in exchange for my fair and honest review. Please see my disclosure policy. This post also contains affiliate links, which means that at no extra cost to you I can make a tiny bit of money to help support this blog. Thank you! Now I haven’t written at all about this here, but since the end of last year my son has been rather obsessed with Nerf guns, so I knew what was coming when we started talking about his 6th birthday party. Gone are the days of Cow themes, Thomas & Friends and Hot Wheels! However, the party took place at a bowling alley, so there was no actual Nerf action. I wanted to make suitable treat bags for the kids – but I knew that some of the families didn’t have Nerf guns at home. And it isn’t the kind of thing that I like to get a child started on if the parents aren’t keen! Looking for inspiration, I headed over to the one-stop party supplies site that is Oriental Trading. Now they feature a LOT of brands and popular characters, but Nerf is not one of them. 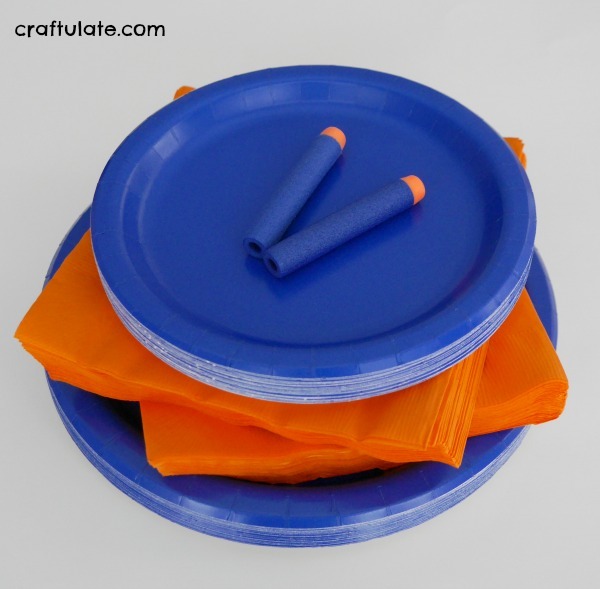 Undeterred I quickly decided that I could make some great cost effective tableware by buying solid blue plates and orange napkins, to get that traditional blend of Nerf colors. For the contents, I chose some dart-shaped blue mini twisty pops, some child-sized orange sunglasses, some foam ball shooter guns and some camo rubber ducks! I tried to keep within the blue and orange theme where possible. I was really happy with this selection which would suit all the party guests, whether they liked Nerf or not! In addition to the goodies from Oriental Trading, I added a tube of mini M&Ms surrounded by a Nerf wrapper that I bought from Etsy, and I made my own “Thanks for coming to my Nerfday Party” bag decoration to complete the themed look.